Richard Löffler attended the 2018 Conference on Artificial Life (ALIFE 2018), which was held at the National Museum of Emerging Science and Innovation (Miraikan) in Tokyo Japan. He presented his work on self-propelled paraffin droplets. During the conference Richard was given the opportunity to present his poster in front of the entire assembly before displaying the poster with the title “Better red than dead: On the influence of Oil Red O dye on complexity of evolution of a camphor-paraffin droplet on the water surface” at the scheduled poster session. The presentation and poster was met with great interest and resulted in abundant advice and ideas to further this very preliminary work. Furthermore, Richard had the opportunity to meet his peers in this field, participating in very inspiring parallel sessions and discussions. During his stay in Japan, Richard Löffler had also the opportunity to participate in the Post-conference following the ALIFE 2018 Conference for Artificial Life. It was held at different venues on Hokkaido, the northern Island of Japan. The theme of the post conference was to come up with new ways to advance the field of artificial life and strategies to bring it to a broader audience. 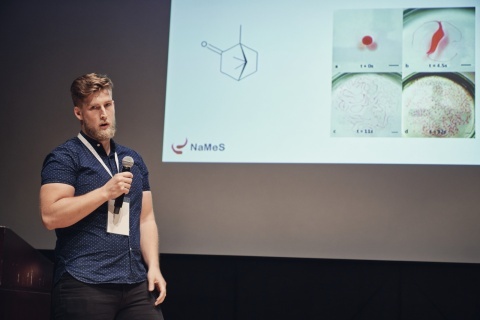 The participants mainly consisted of leading researchers within the field of artificial life which gave Richard ample opportunities to make contacts with possible future employers during the many presentations and following discussions which made this event a productive career building exercise.